The 10134 Y-Wing Attack Starfighter is a Star Wars UCS set released in 2004. The set features a Y-wing starfighter, with intricate detailing and features that are usually present in an Ultimate Collector's Series set. A red astromech droid is included, along with a display stand and collector's card featuring the ship's technical details. The cockpit can also seat a Rebel Pilot, however one is not included with the set. This is a description taken from LEGO.com. Please do not modify it. (see an archive of the product's page) Build the ultimate Y-wing Starfighter™! Battle the forces of the Empire with the Y-wing starfighter! Named for its unusual shape, the classic fighter-bomber of the Rebel Alliance played a key role in the defeat of both Death Stars and the downfall of the Galactic Empire. Exploding with incredible details, the Ultimate Collector Series Y-wing starfighter carries a pair of nose-mounted lasers, an ion cannon turret and an astromech droid for swift escapes into hyperspace. 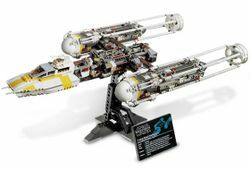 Featuring a special display stand and collector's card, the UCS Y-wing is a fantastic addition to your ultimate Star Wars™ collection! According to the UCS Promotional Poster, this set retired in 2006. The Y-wing in action on the box art. Facts about "10134 UCS Y-Wing Attack Starfighter"